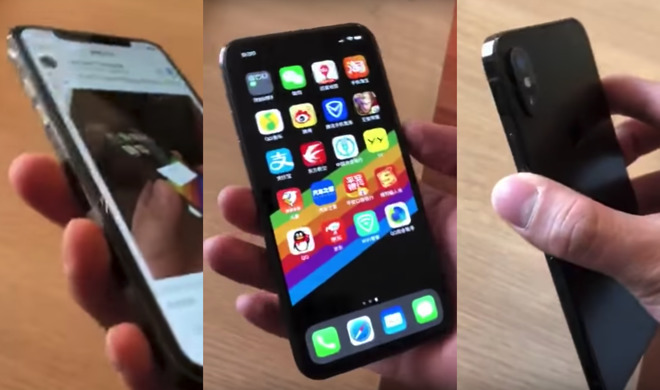 The Weibo video posted by a user identified as "Kimmi," found by Macotakara, depicts an iPhone X-like smartphone being unlocked and used before being placed on a table. The device shown is identified as an "iPhone SE 2," the successor to the iPhone SE, and is shown as having a similar notch, screen, and vertical rear camera arrangement as the premium model. While it may be convincing to some users, a slightly closer look at the video, and reading news about the device strongly suggests that the video is bogus, for quite a few reasons. Starting with the video itself, aside from the lower third graphic asking if it is an "iPhone SE 2," there is nothing actually in the video to suggest what it actually is. If the video is watched without the lower third, many would believe it to simply show someone playing around with an iPhone X. The notch at the top seems to have the same proportions as the iPhone X, and the home icons and general interface seems quiet like users would expect as well. A side view showing the boxier edges may be a sign of it being a different smartphone, but it could also easily be a case for the iPhone X made to look like an older iPhone. There is also no way to compare the physical dimensions of the on-screen phone with others in the Apple range. The iPhone SE is known to be the smallest in the iPhone family, but it is unknown if the one being used is that small, or near to it in size. Apple moving to an iPhone X-inspired design would be illogical for the "iPhone SE 2" in terms of pricing. Adding features that would necessitate the use of the notch, like Face ID's TrueDepth camera, would potentially make the smartphone too expensive for its intended customers in developing markets. Bundling iPhone X features on the cheapest phone in Apple's lineup would also be damaging for the iPhone X itself, as it would give customers less of an incentive to pay the premium cost when they can get similar features at a lower price. Rumors and analyst predictions from the last few months also go against the video being genuine, largely because it is believed it will be an upgrade of specifications rather than a complete redesign. One early rumor suggested it would use a glass sandwich design similar to the iPhone 4, possibly adding wireless charging at the same time. Sources of DigiTimes chimed in with a report in January claiming it will be an "inexpensive smartphone similar to the iPhone SE," one that would include wireless charging, but not "3D sensing." KGI analyst Ming-Chi Kuo advised in the same month of being skeptical at a major update to the iPhone SE, suggesting the successor would more likely have minor changes that wouldn't undercut the premium models. Current rumors point to Apple shipping an "iPhone SE 2," if it exists at all, late in the second quarter, perhaps in May or June.